Why Won’t My Lake Havasu Home Sell? You listed your Lake Havasu home on the market weeks ago. After the initial run of traffic through your front door, interest seemed to have come to a halt. 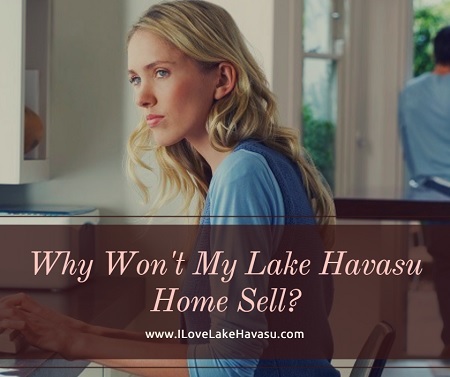 You may find yourself asking, “why won’t my Lake Havasu home sell?” You’re going to need to review your situation first before you can answer that question. First…and most likely…it could be your listing price. You may have the most beautiful home on your street. But, if the list price is too high, no one will want to pay it. In fact, it’s too high, potential buyers won’t even want to bother coming out to see it at all. I spoke about how to price your Lake Havasu home to sell in my previous post. Please go back and read it over. You’ll find several helpful tips there. It might be time to reduce your list price to generate interest again. Talk to your Lake Havasu REALTOR@ about what they are doing to market your Lake Havasu home. Is it listed on the MLS? Have they been hosting open houses? Are they talking about it on their social media? Are you? In general, find out how they have been doing to get the word out about your home to both buyers and their representatives. See if there is any way you can help. With Halloween coming up soon, maybe you can host a costumed open house. Include games and treats for the kids. This keeps them occupied while Mom and Dad take a look at the house itself. Sometimes, a lull has nothing to do with your home at all. Maybe the market just slowed down. Ask your REALTOR@ how long it normally takes for a home to sell in your neighborhood. Are we experiencing a buyer’s market or a seller’s market right now? What kind of feedback has your agent received from buyers and brokers who have walked through your property before? The answers to these questions might take your home’s marketing in a whole new direction. Finally, if all else fails, it just might be time to part ways with your current representation. That doesn’t guarantee that a new agent would have better luck selling your property than your current agent. But, if your agent has trouble answering your questions or just can’t give you a satisfactory answer as to why your home isn’t selling, it might be time to find a new one. However, don’t just accept that they can get you the price you want simply because they said they could. Ask them for the data to back up their claims. You don’t want to get drawn in with promises. Facts prove much more beneficial.